We've published a new book, 'To Follow the Dogs and Carry the Stick', written by one of our members, Bob Jaffray. 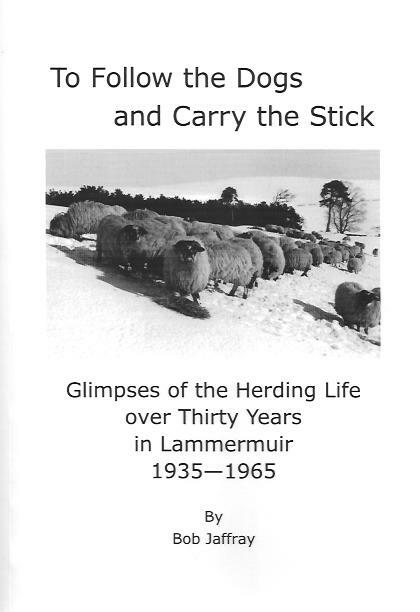 The book's subtitle is 'Glimpses of the Herding Life over Thirty Years in Lammermuir 1935-1965', and as a retired shepherd with a family connection to herding in the Lammermuirs going back to shortly after World War I, Bob recalls his memories of living in remote cottages high up in the hills and his subsequent life as a shepherd. As he writes, ‘by the 1980s, a new mode of herding came into being with economic considerations dictating much larger farms and higher flock numbers ....’. Thus a whole way of life changed and herding techniques and skills which had evolved over hundreds of years are in danger of being forgotten. Bob's aim in the book is to preserve them for posterity. Times were certainly difficult by today’s standards, all provisions and essentials being left at a neighbouring farm as the track to the cottage was effectively impassable, certainly in the wet. Remote as it was not though forgotten by the church, it being written into the minister's’ contract that he should hold an open air sermon on the top of an adjoining hill; Windy Law ‘to bring the gospel to the heathens of Rawburn’. Bob recalls his life at Longformacus Village School with memories of fellow pupils and teachers. Most interestingly, he has included a full list of all who attended the school between the years 1937 and 1945. The figures themselves reflect the period, the number of new admissions (normally 6 or 7 per year), triplicating in the years 1939 and 1940 because of evacuees from the cities. There are recollections of the effects of World War II on such a rural community and how the effect of rationing was not as severe as elsewhere. In 1943, Polish troops were billeted at Longformacus House and the youngsters of the day seem to have mingled freely with the troops, been given access to the vehicles and shown their weapons. After the War, working as shepherd with particular recollections of the harsh winter and the hardships caused. There is a detail of day to day life with all sorts of anecdotes and personal recollections thrown in as well as recalling the practices and methods employed in shepherding, now mostly overtaken. Also included are Jaffray and Welsh (the author’s mother’s name) family trees and well as different maps of the Lammermuirs with copies of charts produced by the Blackface Sheep Breeders Association containing the names of different farms and occupiers, a glossary and more than 40 photographs. An enthralling read, even for people like me, whose knowledge of sheep is barely more than the taste on my dinner plate - certainly a must for anyone connected with farming, shepherding or the Scottish Borders. The book is 94 pages long on heavy paper within card covers and costs £7.50 plus postage. It can be bought at our premises in Galashiels or by choosing the appropriate delivery option and pressing the button below.